Yesterday Molly and I took the mannequins to meet Paula MacGregor Here. Slack Space, Victoria Place Colchester. Here Its the first time I have been in the new building, a vast space that used to be a bank. I just loved Paula's work, we got on really well, we both suffer from the same hoarding problems, we did laugh about this, especially as her husband came in just as we were agreeing about stuff storage, He did mention something about three sheds!!! I am very excited as Paula loved the mannequins and decorated box. So all are to be in the exhibition. I think it runs from 18th April but will update you all on the exact dates AND you will all get invited to the Private View evening. 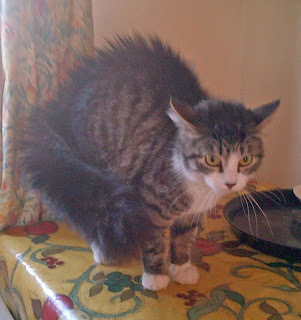 Went to visit my friend Linda Wilks Here her cat was a wee bit shocked by Molly's appearance. Linda makes the best Victoria sponge cakes, she gave me a huge slice, home made jam too. Lovely visit. Paula is great isn't she, such an amazing artist.. I just adore her work. Are you up for our meeting this week? Perhaps we could include a gallery visit to see your work..
Poor Florence she did look frightened. Its not surprising she as she doesn't see many dogs only Tilly.I hope Molly was ok.